Indoor plants (or houseplants if you prefer that name) are a nice way to step into the world of gardening, regardless of how much space you have available outside. It’s all fairly manageable in terms of scale and complexity, and you quickly learn the basics of maintaining a plant. You don’t have to worry about the weather, or garden pests to any real degree. Many an avid gardener’s lifelong passion was started with an indoor plant! More importantly, for those living in high density housing, like flats, or apartments, and that don’t have balconies or outdoor space, indoor plants are the only option if you want your own little personal connection with nature. Indoor plants are utilised as design features in interior design, and can add interest and a touch of life to an otherwise plain living space. Beyond their aesthetic value, indoor plants have a tremendous health benefit to us, especially in this modern age where we tend to make extensive use of man-made materials, which is not without consequence. Here is an extract from NASA-STI (Scientific and Technical Information), and yes, that is the US space agency that builds rockets, satellites, space shuttles and put man on the moon, etc. NASA describes its STI (scientific and technical information) as “the collected set of facts, analyses, and conclusions resulting from scientific, technical, and related engineering research and development efforts, both basic and applied.” So you can be assured this is hard scientific fact. “Although one of NASA’s goals is to send people to the far reaches of our universe, it is still well known that people need Earth. We understand that humankind’s existence relies on its complex relationship with this planet’s environment—in particular, the regenerative qualities of Earth’s ecosystems. He was funded by the Space Agency to research the environment’s natural abilities to clean itself as part of what is now Stennis’ Environmental Assurance Program. The goals were to clean the Center of chemicals left behind through wastes and to supply information to NASA engineers about closed-environment “eco” support that may prove helpful in designing sustainable living environments for long-term habitation of space. A tertiary goal was to provide usable technologies to NASA’s Technology Utilization Program, essentially making the research available to the American public. …NASA scientists identified 107 volatile organic compounds (VOCs) in the air inside the Skylab space station. Synthetic materials … used to construct Skylab, give off low levels of chemicals… such as formaldehyde, benzene, and trichloroethylene, all known irritants and potential carcinogens. “If man is to move into closed environments, on Earth or in space, he must take along nature’s life support system.” Plants. Before the houseplants were added, … anyone entering the newly constructed facility would experience burning eyes and respiratory difficulties… Once the plants were introduced… the symptoms disappeared. One of the NASA experiments testing this solution was the BioHome, an early experiment in what the Agency called “closed ecological life support systems.” The BioHome, a tightly sealed building constructed entirely of synthetic materials, was designed as suitable for one person to live in, with a great deal of the interior occupied by houseplants. Before the houseplants were added, though, anyone entering the newly constructed facility would experience burning eyes and respiratory difficulties, two of the most common symptoms of Sick Building Syndrome. Once the plants were introduced to the environment, analysis of the air quality indicated that most of the VOCs had been removed, and the symptoms disappeared. After serving over 30 years as a government scientist, Wolverton retired from civil service but continued his work in air and water quality by founding Wolverton Environmental Services Inc. The company, based just down the road from Stennis in Picayune, Mississippi, is an environmental consulting firm that gives customers access to Wolverton’s decades of cutting-edge bioremediation research. So yes, Sick Building Syndrome is a fact, synthetic man-made materials do release toxic and dangerous volatile organic compounds, many of them carcinogenic (cancer causing) into the air inside buildings, and indoor plants do remove them from the air. Obviously there are others who disagree with the findings of NASA but consider this point. NASA’s agenda is purely scientific, about maintaining conditions that support life up in outer space. Back down here on the ground, this information runs counter to the financial interests of those manufacturing man made building materials, paints, plastics and other synthetics, fuels, solvents, pesticides, cleaning compounds, detergents and almost everything else coming out of the chemical industry! Research has shown that certain indoor plants are better at removing specific chemicals than others. It lists the 20 plants that were rated the highest for removal of chemicals from the air out of the fifty plants tested. Semi-sun Very easy to grow. NASA’s research recommends 15 to 18 good sized plants in 6-8 inch (15-20cm) wide pots to improve the quality of the air in a 1,800 square-foot (167 square-metre) house. If you need to scale this down to a smaller space, such as a room or office, the recommendation is a minimum of two plants per 100 square feet of floor space in a building with 8- to 10-foot ceilings. The rates at which plants clean the air will vary depending on the size of the plant (the effectiveness improves as the plant grows), the temperature of the air and the amount of pollution present. The area of space surrounding a person, about 0.17 to 0.23 cubic metres (6-8 cubic feet) of it in fact, is termed the personal breathing zone. This is usually areas where an individual remains for several hours working, watching TV or asleep. Plants placed within this zone can add humidity, remove bioeffluents and chemical toxins and suppress airborne microbes. 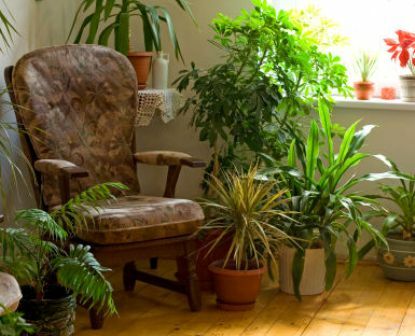 Plant-filled rooms contained 50 to 60% fewer airborne moulds and bacteria than plant-less rooms. Volatile Organic Compounds (VOCs) area a group of chemicals that contain organic carbon, and readily evaporate – changing from liquids to gases when exposed to air. Should you be worried about these pollutants? Are they really a concern? Most definitely! In case you have any doubts, and haven’t realised that all technological progress comes at a price, then read on. How can volatile organic compounds affect my health? The health effects of volatile organic compounds can vary greatly according to the compound, which can range from being highly toxic to having no known health effects. The health effects of volatile organic compounds will depend on nature of the volatile organic compound, the level of exposure, and length of exposure. According to the Eleventh Report on Carcinogens published by the National Toxicology Program, benzene is “known to be a human carcinogen”; formaldehyde and percholroethylene are “reasonably anticipated to be carcinogens.” People at the highest risk of long-term exposure to these three volatile organic compounds are industrial workers who have prolonged exposure to the compounds in the workplace; cigarette smokers; and people who have prolonged exposure to emissions from heavy motor vehicle traffic. Long-term exposure to volatile organic compounds can cause damage to the liver, kidneys and central nervous system. Short-term exposure to volatile organic compounds can cause eye and respiratory tract irritation, headaches, dizziness, visual disorders, fatigue, loss of coordination, allergic skin reactions, nausea, and memory impairment. That should clear up any doubts about the nature of these substances. You may be wondering where how these chemicals get into your indoor living space in the first place. From the Minnesota Department of Health’s article “Volatile Organic Compounds (VOCs) in Your Home“, I’ve reproduced portions of the article for the purpose of reference, as it provides further information on VOC sources. What are the health effects of VOC exposure? The risk of health effects from inhaling any chemical depends on how much is in the air, how long and how often a person breathes it in. Scientists look at short-term (acute) exposures as hours to days or long-term (chronic) exposures as years to even lifetime. Breathing low levels of VOCs for long periods of time may increase some people’s risk of health problems. Several studies suggest that exposure to VOCs may make symptoms worse in people who have asthma or are particularly sensitive to chemicals. These are much different exposures than occupational exposures to VOCs. What levels of VOCs is safe? The best health protection measure is to limit your exposure to products and materials that contain VOCs when possible. If you think you may be having health problems caused by VOCs, try reducing levels in your home. If symptoms persist, consult with your doctor to rule out ore serious health conditions that may have similar symptoms. The most effective action is to remove the product that gives off VOCs. Most products containing VOCs will off-gas within a short period of time, although some will continue to give off VOCs for a longer period of time. As a last resort, airtight sealers have been used to minimize VOC emissions. Check with vendors of composite wood products to choose a non-toxic sealant to reduce exposure to VOCs. 2. Ventilation and climate control can be used to reduce exposure to VOCs. If you have a choice, perform renovations when home is unoccupied or during seasons that will allow for additional ventilation. In summary, the most effective way to limit VOCs indoors is to limit the potential sources of VOCs. Increasing the amount of outdoor “fresh air” into a space can also dilute and reduce VOC levels. I’m hoping at this point that I haven’t terrified you into filling every square inch of your home completely with plants! The point, which I hope I’ve sufficiently illustrated, with factual evidence from credible sources, is that VOCs are very toxic substances present in our indoor living spaces that can effectively be reduced/removed with indoor plants. Most indoor plants have very high rates of photosynthesis which allow them to grow in very dim light, because they typically grow under the shade of the canopy of tropical or subtropical forests. This attribute also allows them to grow indoors. Air pollutants are are removed from the air by being absorbed through microscopic pores in plant’s leaves called stomata. They are moved, by a process called translocation, which moves sugars and other substances through the plant, to the root zone, where they are broken down by soil microbes. Some chemicals, are, however, broken down by the plant’s own biological processes without involving the action of soil microbes. Soil microbes break down the pollutants into substances that can be used as food by the microbes and the plant. Soil microbes break down the pollutants into substances that can be used as food by the microbes and the plant. Many different types of micro-organisms live in the soil, and one of the many things that they do is to make nutrients available to plants and to detoxifying the soil. Soil microbes adapt readily to their surroundings, as they have the ability to mutate in response to changes in their environment. The longer they are exposed to toxic substances, the better they become at breaking them down, so, the longer we keep our houseplants, the better they will be in their ability to clean the air. While most plants open the pores in their leaves (stomata) during the day for photosynthesis, and therefore absorb air pollutants during that time, some plants, including most cacti, succulents, orchids and bromeliads, act in the opposite way, opening their stomata at night, and therefore absorbing air pollutants at night. So, with the right selection of indoor plants, you can continuously purify the air, day and night! Since I’ve mentioned references to the Top 50 plants recommended by Dr. B.C. Wolverton from “How to Grow Fresh Air: 50 Houseplants that Purify your Home or Office” throughout this article, I thought it best to list the 50 plants to satisfy your curiosity! Please note, many other plants can also remove chemical air pollutants too, and this is just the list of the ones tested and included in Dr. Wolverton’s book. For my last thirty years of living in the UK I always had a house full of house plants. During my last eight years in Australia I’ve had plenty of plants on patios and verandahs but NONE INSIDE! Thank you for reminding me of the good sense of growing these plants indoors. I will rectify the situation!! Thank you again for the enormous amount of useful info that you have posted on your site. Great work and good luck with your garden during the forthcoming seasons. Some of the plants are much easier to get hold of than others, but I would recommend particularly Janet Craig and the Snake Plant for their air cleaning properties. I have most of these plants, had no trouble getting hold of them in Australia. If you’re somewhere where they’re hard to find, propagate them if possible (most propagate very easily) and give them to your friends to sprread them around. If they then do the same, no more shortage. All it takes is one’s person’s initial effort. It’s a good way to get a lot of useful plants dustributed throughout the community. I agree Blackthorn, I used to have a friend who owned a spider plant and each summer it produced several “plantlets” (or “baby plants”! ), one of which I grew and now have several full size spider plants inside the home. I’d definitely recommend this for other plants if they spread like this as it’s just so easy to grow them this way. Would a Goji fruit tree work good inside? Any pet-safe plant that you know of? Pets normally don’t eat indoor plants as far as I know. Nearly all indoor plants are subtropical or tropical forest understory plants and nearly all have evolved natural defences to discourage animals from eating them and probably all taste very unpleasant. If they didn’t, you’ll probably be adding them to your salad too! Yes, goji berries can be grown as indoor plants in a brightly lit area, but they don’t get very big and don’t produce much berries, but they do make interesting indoor plants. I also have a cat problem. No matter that she has her own toilet, she always prefer to pee in one of the pots!! I’ve tried so much techniques but she won’t learn! Please, if you know a trick that works tell me!